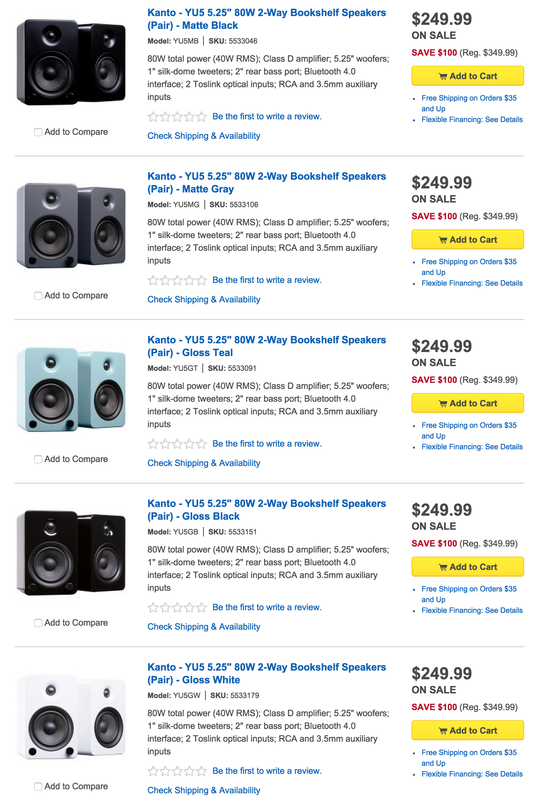 Best Buy’s Official eBay Storefront offers the Kanto YU5 Bluetooth 4.0 Bookshelf Speakers in five colors for $249.99 shipped. Also available direct from Best Buy. Today’s deal is $200 off the original MSRP, $100 better than Amazon and the lowest price that we can currently find. These aren’t your standard bookshelf speakers – Kanto has included Bluetooth 4.0 connectivity with aptX support as well as optical, 3.5mm and RCA inputs. All of these connectivity options make this pair of speakers an excellent companion for your TV, computer or home audio setup. A one-inch silk dome tweeter, five-inch kevlar driver, two-inch bass port and “acoustic grade” cabinets pump out 80W of power. Additional features include auto-standby mode and an included remote control. Amazon customers rate these speakers 4.4/5 stars.